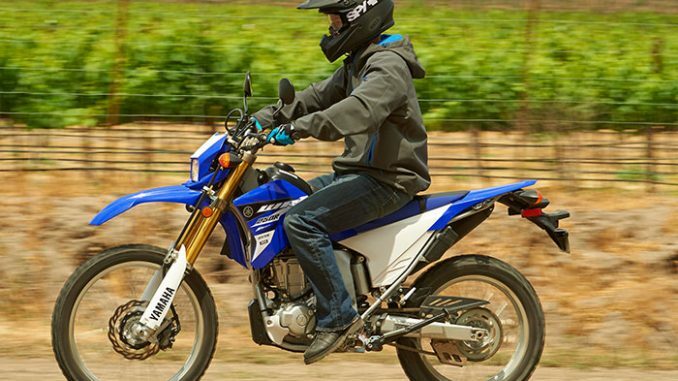 The 2015 Yamaha WR250R offers the best of both worlds, a light and nimble aluminum frame, a powerful liquid cooled engine with titanium valves, and long suspension for off-road adventures. Plus, all the equipment to make your on road travels more than just a commute. Add in high end components and you have one of the world’s most advanced 250cc dual purpose bikes, bar none. Inspired by our legendary WR off road series, the WR250R is a machine that offers incredible performance on road and off. Discover for yourself just how 250cc of fuel injected power can push the limits of performance. 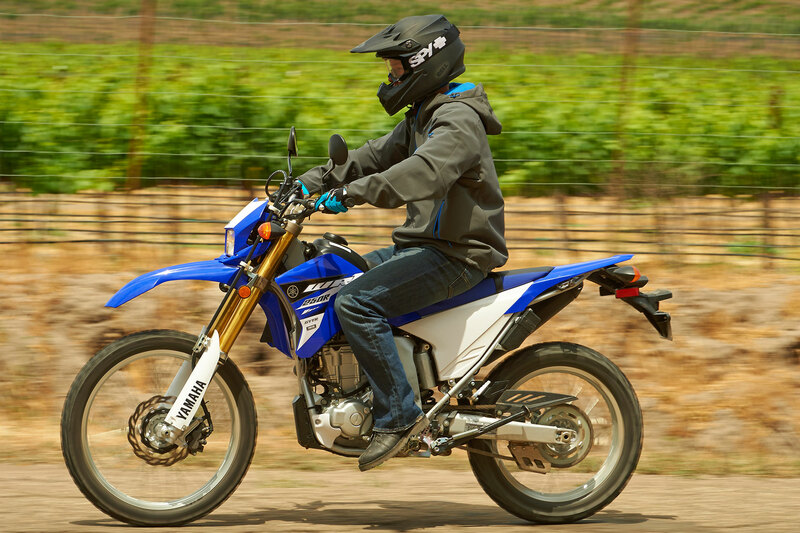 The WR250R is ready to tame the twistest road or the toughest trail … with power, handling and style. •Directly descended from our YZ motocrossers and WR off-road machines, the WR250R is here to make Yamaha’s off-road prowess street accessible. 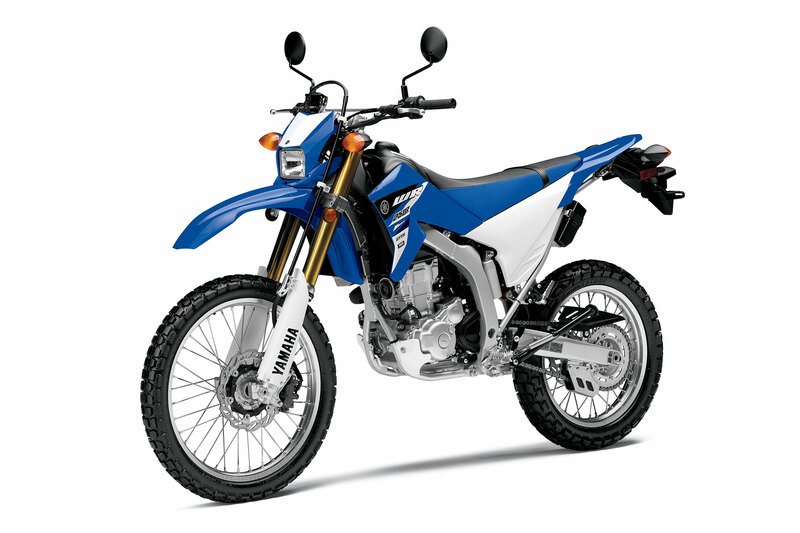 •Not exactly an enduro model and not a streetbike either, the WR250R is for riders who ride off-road more than on. • Potent, liquid-cooled, 250cc, DOHC, 4-valve, 4-stroke powerplant with super light titanium intake valves and electronic fuel injection. • Super convenient electric starting means fast, sure starts. • Hassle free automatic decompression system ensures fast starting and reduces battery power requirements. • Lightweight magnesium cylinder head cover helps reduce weight. • Double overhead cam, 4-valve combustion chamber features a compact “pent-roof” design for maximum breathing efficiency. • Downdraft -type straight design intake port provides the most efficient intake flow for maximum engine performance. • Lightweight titanium intake valves and load-reduced valve springs decrease weight by more than 40% (Vs steel valves). Titanium valves reduce reciprocating mass for faster-revving, plus reduced frictional losses for smoother-hitting power delivery across the rev range. Intake valves are 30mm in diameter, while the steel exhaust valves are 24.5mm in diameter. • Steep valve angles, 11.5 degrees on the intake side and 12.5 degrees on the exhaust produce a more compact combustion chamber. • Dual electrode NGK CR9EK spark plug is located in the centre of the combustion chamber for fast, controlled combustion and great throttle response. • Ceramic composite plated cylinder provides excellent heat dissipation for consistent power delivery, reduced friction for increased power and reduced weight since there is no sleeve or liner. • Special design crankcases also utilize “cutaways” to reduce “pumping losses.” The crankcase cutaways match the cutaways in the cylinder to reduce pumping losses. • The crankcases feature a “tri-axis” design for the crankshaft, main and drive axles. This tri-axis design keeps the crankcases more compact while also centralizing mass for better handling. All of the shafts are positioned low in the cases to maintain a low centre of gravity for great handling and maneuverability. • Lightweight, high strength, short-skirt, forged aluminum piston provides great durability and its lightweight design means fast engine response and reduced mechanical vibration. • Lightweight roller bearing style crankshaft with optimized mass delivers excellent throttle response and strong acceleration. • Engine counter balancer reduces vibration for improved rider comfort and reduced rider fatigue. This bike can cruise at highway speeds comfortably. • Special design high performance camshafts (intake & exhaust) provide outstanding class leading power. The cams feature a WPC (Wonder Process Craft) treatment that increases surface hardness for great durability and reduced sliding resistance. • Wet sump lubrication system is used. This system reduces weight and the number of moving parts versus a dry sump system. • Oil volume in engine has been optimized to reduce weight and oil “drag” related power losses. • Easy access element-type oil filter is used. • Compact design hydraulic automatic cam chain tensioner reduces maintenance and mechanical engine noise. • 38mm, Mikuni electronic throttle body fuel injection system is used. This system is a return-less FI system with TPS (throttle position sensor). It provides excellent throttle response, great fuel economy, reduced emissions and a choke-free design. • Long nozzle type 12 hole injector is used and provides a dual spray pattern for excellent fuel atomization and best in class performance. • Easy to service 4.1 liter air box with a intake control valve provides state of the art intake and emission control. The foam air filter is a washable design. • Compact 16 bit ECU features 3D ignition mapping to accentuate the engine power characteristics. The ECU provides optimal timing at all rpms for fast engine response. • Wide ratio 6-speed transmission features gear ratios designed for on and off road riding. This transmission adopts a “shower type” lubrication system for great reliability. 6th gear is an overdrive gear to reduce engine rpm at highway speeds. • Heavy-duty clutch matches engine output and offers a light, progressive clutch feel with less lever effort. • Quick-access, lightweight aluminum outer clutch cover allows fast, easy access to the clutch. • Single, 9.5KW rad is used. The “exhaust air” (after it has passed through the rad) is directed away from the rider for excellent rider comfort. An electric cooling fan maintains consistent engine temperatures even in stop and go traffic. The single rad is located on the left side of the fuel tank. • Lightweight, compact “rare-earth-type” ACM (alternating current magneto … 14V & 350W output ) is used. • Upswept exhaust system features a stainless steel header pipe and a compact 3-stage expansion type muffler with a honeycomb catalyzer to reduce exhaust emissions. This system maximizes engine power and allows hassle-free replacement of the oil filter element. It features a cleanable screen-type spark arrestor. Heat shields protect rider and passenger. • The exhaust system also features Yamaha’s EXUP System (Exhaust Ultimate Power Valve). The single butterfly valve prevents the “blow back” phenomenon caused by “valve overlap”. The EXUP system eliminates “flat spots” in the power band and reduces emissions too. • Lightweight, compact aluminum semi-double-cradle frame features a variety of components. The main frame is cast aluminum, while forged aluminum is used under the main frame below the steering head area and separate detachable down tubes are thin walled high tensile steel. Yamaha has maintained the semi double cradle design to allow for “controlled flex” to optimize suspension action. This frame design provides a low centre of gravity for a light feel and razor sharp handling. • Detachable high tensile steel rear sub frame is constructed of round steel pipe. The detachable design provides easy rear suspension access and reduces costs in the event of loop out. • Lightweight, tapered, aluminum swingarm features a mix of extruded, cast and forged parts. This unique rear arm provides the best rigidity-strength balance plus a dynamic look too. • 46mm, adjustable inverted, Kayaba cartridge fork provide excellent suspension performance. Front wheel travel is 270mm (10.6″). Front fork adjustments include: 19-way compression damping and 17-way rebound damping. • Cast aluminum upper triple clamp and forged aluminum lower triple clamp reduce weight and provides excellent strength. The steering stem is light weight aluminum. The fork features a 25mm offset and a 28mm axle offset for great stability and neutral steering characteristics. • YZ inspired “cantilever style” fork protectors wrap around the fork tubes for increased protection against dirt, mud and stone chips. These fork protectors are self-supporting to reduce friction for smoother fork operation. • Monocross rear suspension system features a fully adjustable, piggy-back style shock. Rear shock adjustments include: spring preload, 12 way compression damping and 23 way rebound damping. Rear wheel travel is 270mm (10.6″). • Link-type rear suspension provides a rising rate (progressive) suspension function. 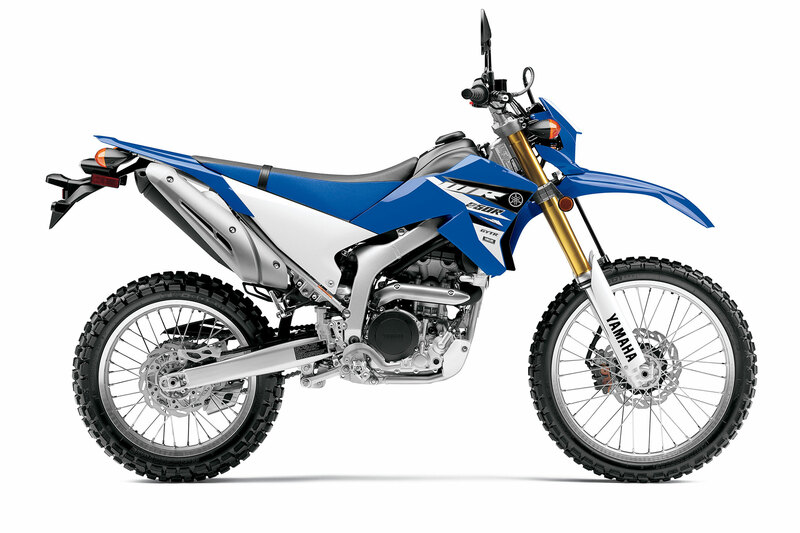 The linkage design is very similar to those used on the YZ/WR competition line-up. The linkage system provides a progressive function. As wheel travel increases, the shock absorber “resistance” increases as well. The benefit is the suspension is complaint on soft or small bumps but thanks to the changing lever ratio of the linkage, the system can also absorb bigger bumps without bottoming out. • 230mm rear disc utilizes a lightweight “wave style” rotor. The Nissin single piston caliper and an integrated Nissin rear master cylinder (fluid reservoir is integrated into the top of the master cylinder to reduce weight) delivers strong, progressive stopping power with excellent control and feel. • Rugged yet light aluminum DID 21″ (21 x 1.60) front and 18″ (18 x 2.15) rear rims provide exceptional durability and help reduce unsprung weight for optimal suspension performance. Straight pull spokes are utilized. • Competition WR series inspired lightweight, digital meter assembly. There are 2 modes. Basic mode features include: speedometer, odometer, dual tripmeters, and a clock plus FI system diagnostics. A stopwatch and distance-compensating tripmeter can be found in the “measurement or pace management mode”. • Gripper seat cover is based on the competition YZ/WR style seat. • Stylish slim design front halogen headlight offers 60/55 watts of lighting power. • Heavy duty plastic (polypropylene) guards in front of the water pump and stator cover. 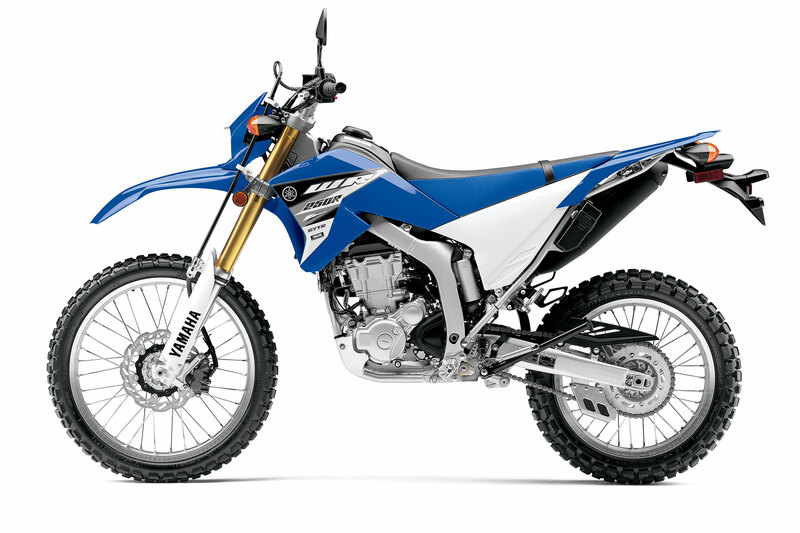 • Premium dual sport tires offer good traction in the dirt and on the road. • Slim design 7.6 liter steel fuel tank with built-in electic fuel pump. • Low fuel warning light. The low fuel light will activate with 2.1 liters of fuel remaining. • Serrated, aluminum rear brake lever. • Compact, low-maintenance 6 amp hour battery is gel-filled type to prevent leaks in the event of a tip-over. • Lightweight chain guide / support helps reduce chance of chain derailment. Also helps protect rear sprocket too. Mikuni 38mm throttle body F.I.